Still geared towards a budget-cautious clientele, this 2019 sequel to the March 2018 Vivo One Plus offers a bunch of entry-level pros and cons, while bringing to mind some full-fledged flagship phablets with its wide 6.2-inch 19:9 facade , although it is marred by a modest 1520 x 720 resolution and a 271ppi-only pixel density score . 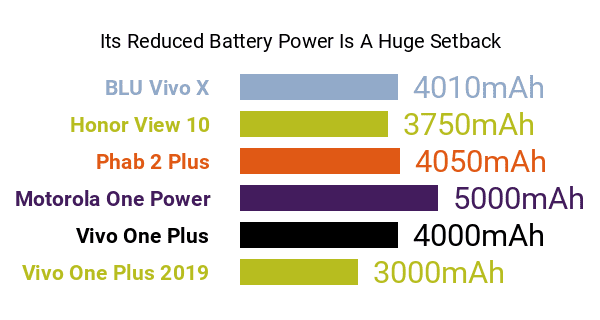 The BLU Vivo One Plus 2019's weaknesses also include its disappointing drop from the older model's 4000mAh power cap to only 3000mAh . 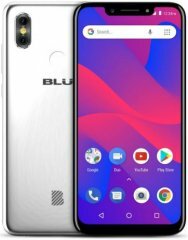 To make up for this con, BLU arms this 2019 edition with a dedicated extreme power-saving button , which instantly turns off non-essentials functions to maximize the phone's up-time on low power levels. Another key difference between this 2019 version and its 2018 predecessor is that it now comes with a dual-lens camera setup (The 2018 model touts a single 13-megapixel main cam) that calls up this Phonerated list of high-class photography smartphones. Its dual camera, which happens to be its biggest pro, consists of a 13-megapixel primary lens and a 2-megapixel subsidy lens for depth analysis. 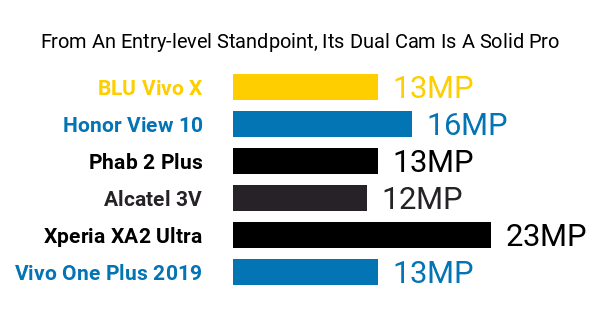 Regrettably, however, it downgrades the original Vivo One Plus's 13-megapixel selfie cam to an 8-megapixel-only shooter , although it does squeeze a front-firing LED flash into its list of specs. As we anticipated from a low-budget Android, the Vivo One Plus 2019's hardware pros and cons include a mundane quad-core-only 1.5GHz MediaTek 6739 processor that barely posed a threat to the engines used by the best octa-core phones available as of this on-paper review. Its CPU is aided by an equally-basic IMG Power VR GE8100 graphics processor and no more than 2GB of RAM . Moreover, it only comes with 16GB of native memory that's accompanied by an unimpressive up-to-64GB memory expansion support. With a standard fingerprint reader and two SIM card slots rounding out its feature set, it's obvious that the Vivo One Plus 2019 caters to entry-level smartphone shoppers eying a cheap large-screen model.